A native of Downey, CA, Dr. Park attended the University of California, San Diego and received his Bachelor of Science in biochemistry and cell biology. He then attended Boston University School of Medicine, where he received his master’s in medical sciences, and went on to receive his Doctorate of Dental Medicine from Temple University School of Dentistry. Later, he served as a chief resident in UCLA’s advanced education in general dentistry program. During his residency, Dr. Park had extensive training in implantology, full-mouth reconstruction, and cosmetic dentistry. Because the landscape of dentistry is constantly changing, continuing education is of paramount importance to Dr. Park in order to offer the best care for his patients. Currently, Dr. Park is a fellow in the International Congress of Oral Implantologists, and an active member of the Orange County Dental Society, California Dental Association, American Dental Association, Academy of General Dentistry, and the Academy of Osseointegration. According to multiple patient testimonials, Dr. Park is best known for his professional yet gentle and attentive care as a dentist. 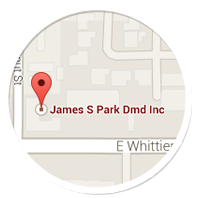 As a local dentist in La Habra, Dr. Park is committed to the community, both in and out of the office. He is involved with Rotary Club and Chamber of Commerce for La Habra, and is active in spreading the message of oral health and disease prevention. 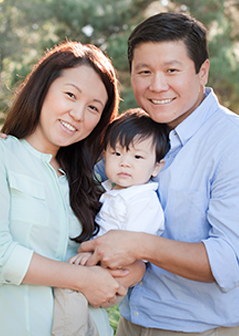 Dr. Park resides in Newport Beach with his wife Josie, and their son Bryce. In his free time, he enjoys swimming and playing golf, and trying to break 90 in his golf game. One of his many goals in life is to visit all the major league baseball parks, and he’s almost there: 18 down, 12 more to go!